We’re all familiar with Hans Christian Andersen’s most popular fairy tales. He’s the man behind “The Ugly Duckling”, “The Little Mermaid”, “Tumbelina”, and “The Snow Queen”. This story is one that you may not know. Read all about The Money-Pig in this excerpt from the beautiful Knickerbocker Classic edition of The Fairy Tales and Stories of Hans Christian Andersen by Hans Christian Andersen. There was such a lot of toys in the nursery; on the top of the chest of drawers stood the money-box. It was made of clay in the shape of a pig, and had the usual slit in its back, but this slit had been made bigger with a knife, so that silver dollars could also be put into it; two of these had already passed through, besides many other kinds of money. The money-pig was so stuffed that he could not rattle any longer, and that is the highest a money-pig can attain to. There he stood on top of the chest of drawers and looked down upon everything in the room; he knew well enough that with what he had in his stomach he could buy the whole lot of them, and that’s what is called having confidence in oneself. The other toys thought the same, although they did not say so; there were other things to talk about. The top drawer was partly open, and there a large doll appeared; she was rather old, and had had her neck riveted. She looked round and said: “Shall we play men and women? It’ll be something for a change.” And then there was a commotion! Even the pictures on the wall turned themselves round; they knew that they had another side as well, but they did not turn round just for the sake of contradicting. The money-pig was the only one who got a written invitation; he stood too high, they all thought, to hear them if they spoke to him. He did not send word, either, whether he was coming, for he did not turn up. If he was to take any part in it he would have to enjoy it up there from his own point of view. They would make their arrangements accordingly, and so they did. The little toy-theater was at once placed so that he could look straight into it; they wanted to begin with a play, and afterward there were to be tea and mental exercises, but they commenced with the latter. The rocking horse talked about training and thoroughbreds, the perambulator about railways and steam power—all of which were matters connected with their occupations, and which they could discuss. The parlor clock talked about politics—tick-tick! it knew the time of the day, but it was said that it did not go correctly. The bamboo cane stood there, proud of its ferrule and silver button, because it was mounted both at top and toe; in the sofa lay two embroidered cushions; they looked very pretty and stupid. And then the play was to begin. All were seated and looked on; they had been requested to rap, crack, and rattle, according as they were pleased. But the riding-whip said he would never rap to old people, only to those who were not engaged to be married. “I’ll crack to all and everything!” said the percussion cap. “One has to be in some place, after all!” thought the spittoon; this was the kind of thoughts they had in their minds as they sat at the play. The piece was not of much account, but it was well performed; all the actors turned their colored side to the audience, for they had only been made to be seen on the one side and not on the other. They all played excellently; they came right out in front of the stage; their strings were too long, but this made them all the more noticeable. The doll with the riveted neck became so excited that the rivets got loose, and the money-pig became so excited in his way that he made up his mind to do something for one of them, to put him in his will as the one who should be publicly buried with him, when the time came. It was such a treat that they gave up tea and went on with mental exercises, which they called playing men and women, and there was no harm in that, for they were only playing—and everyone was thinking about himself and what the money-pig thought; but the money-pig’s thoughts went farthest, for he was thinking about his will and burial and when it would come to pass—always sooner than you expect it! Crash!—and there he lay on the floor, all in bits and pieces, while the money danced and rolled about; the smaller pieces whirled round and round, and the bigger ones rolled along the floor, particularly one of the silver dollars, who wanted to see the world in earnest. And so he did, and so did all the rest; the pieces of the money-pig were thrown into the pail, but next day on the top of the chest of drawers stood a new money-pig of clay; as yet there was not a penny in him and so he could not rattle. In this respect he was like the other, and this was at any rate a beginning, so with this we will come to an end. 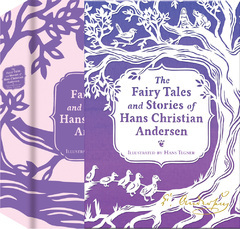 Let your imagination soar with this stunning gift edition of Hans Christian Andersen’s classic fairy tales! The Fairy Tales and Stories of Hans Christian Andersen is the next edition in the Knickerbocker Classic series, featuring works from the famous Danish poet. His classic works include fairy-tale favorites such as, “The Little Mermaid”, “The Ugly Duckling”, “The Princess and the Pea”, “Thumbelina”, and “The Emperor’s New Clothes”. Perfect for adults and children alike, The Fairy Tales of Hans Christian Andersen includes a ribbon marker to insure you’ll never lose your place at bedtime. This stunning gift edition also has a full cloth binding, foil blocking on the spine, and is packaged neatly in an elegant slipcase.